This page summarizes the new features added in ConVirt Enterprise 3.3 release. For learning about ConVirt Cloud features, please refer to ConVirt Enterprise Cloud documentation. The search feature allows you to simply search at global level and get to any entity quicker. As you type, handful of choices are presented unless that search results in too many items. With this release, each annotation is kept and available as history. This allows enterprises to keep a log of activities and communication between admins on how the issue was handled. Now in addition to LDAP servers, enterprise customer can use their existing Active Directory setup with ConVirt. For larger environments, the host state detection is done using nmap if it is installed on the system for quicker detection. 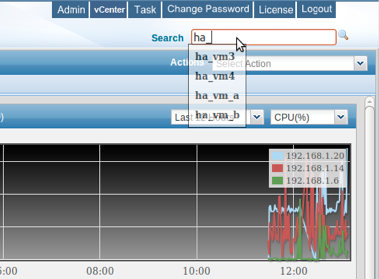 Along with this, multiple VMs are started during the recovery reducing the over all downtime. There has been significant improvements in the dashboard performance. Quicker load of the navigator and not refreshing the dashboard while getting to context menu improves the overall usability of the product. Since 3.3.3, OVF Templates are supported for standalone ESXi and vCenter deployments. Starting 3.3.6, full snapshot management for virtual machines is supported for both standalone ESXi/vSphere as well as vCenter environments. 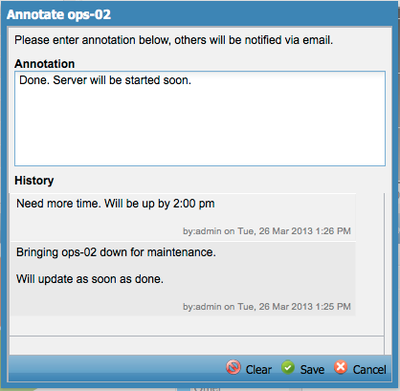 Starting 3.3.6, ConVirt shows alerts from vCenter in to a new Alerts tab in ConVirt. Starting 3.3.9, ConVirt supports managing Hyper-V virtualization. Refer to managing Hyper-V environment for more details.